Lately, I have thought a good bit about the idea of Museums as third places – not work or home, but places where people regularly go to socialize and be in community. Ray Oldenburg published on this concept a while ago. He suggests that today’s coffee house best typifies the third place concept in North America. Specific to museums, Nina Simon’s Museum 2.0 blog took up this discussion in June of this year. In the Museum 2.0 blog posts written by both Simon and guests, along with comment feedback, there was much back-and-forth on whether museums are able to function as third places. But why is the third place an important discussion for museums? At the C.H. Nash Museum, the third space idea is relevant as we attempt to build more engaged relationships with our visitors and in our role as a social asset in southwest Memphis. The engagement is not just a matter of building attendance and revenue streams, but rather, as central to our function as a community stakeholder and partner. Here are a couple of museums where the third place concept seems to work. At the Sunwatch Village, a circa 1200 – 1500 AD American Indian site and museum near Dayton, Ohio, Site Manager Andy Sawyer developed regular gatherings of the Native American community via the Miami Valley Flute Circle for concerts and socializing. These public concerts have a strong community building component. Visitors are encouraged to bring their picnic dinners, visit, and turn the gathering into a true social event. The Flute Circle is different from the typical Festival or Powwow event in their regularity (monthly) and the community component of both Native and non-Native participants. Conceptually, the Flute Circle is similar to a series of Sunday evening concerts in the park or coffee house acoustic performances, only in a museum setting. Of added significance at Sunwatch, is the relevancy of a Native American musical form being played at a traditional Native American site. 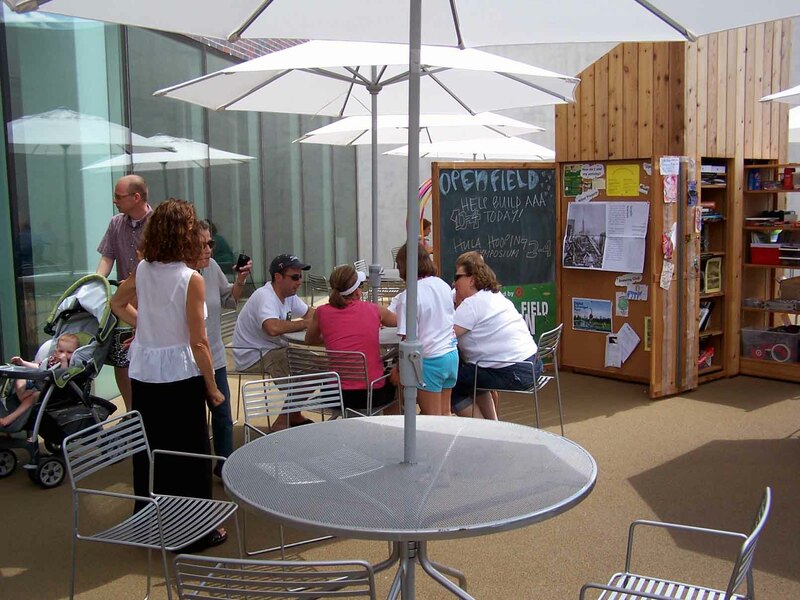 Another example of the third place is at the Walker Art Center of Minneapolis’ Open Field described as “an experimental project of the Walker Art Center that invites the public to help transform our big, green backyard into a cultural commons. It’s a place to share experiences, interests, and talents and celebrate the creative assets and collective knowledge that abound in the Twin Cities.” During my recent Saturday visit to the Walker Art Center, the activities in the Open Field consisted of a coffee shop/lounge type space for refreshments and visiting, an area for hoola-hoop contests, drawing, lounging, WiFi and such. Also going on was and a very cool Red 76 participatory project of building a school in the Open Field made completely of surplus materials from the Walker Art Center. There is no fee to take part in any of the Open Field activities. During my Saturday visit, the participation seemed largely as an add-on to folks who were already visiting the sculpture garden or the Museum itself. However, when considering the potential draw from the nearby Loring Park complex, the Open Field of the Art Center could very much become a regular social destination for folks. The Sunwatch and Walker Art Center are two examples of how the third place concept is applicable to Museums. Third places seem a logical direction for museums in an era of heightened demands for an engaged visitor experience. Pragmatically, as museum staff sizes either stagnate or shrink, developing venues as third places where visitors become more active as institutional stakeholders is an important step. In this capacity, the distinctions between volunteer, visitor, participant and stakeholder likely will develop more grey area. What are your thoughts or experiences on Museums as Third Places?